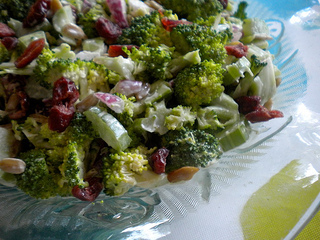 A cold vegetable salad is a perfect side or main dish for any pool gathering. No cooking, make ahead, and good for you - find a recipe you and your family are sure to enjoy here. I love broccoli salad recipes that can be made ahead of time so that when company comes I can spend my time with them - out by the pool rather than in the kitchen. Cut off the large thick stems of the broccoli and toss. Cut up the broccoli flowerettes into small bite size pieces. Cut up celery & red onion. Toss all ingredients with the dressing and refrigerate for 3-4 hours. 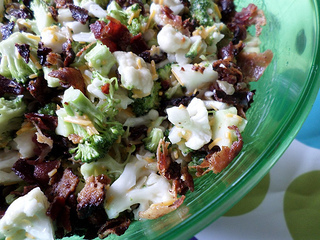 Some friends brought this broccoli cauliflower salad recipe over for one of our pool parties. There was not a bite left. She told me it was called the Sunshine Salad. I made it for our annual Fourth of July pool party. Here is how my friend Shirley makes it. 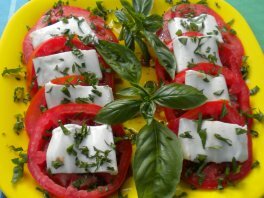 A tomato mozzarella salad is a favorite cold salad at our house - especially now that there is farmer's market just a couple of blocks from our house. Every week we buy a basket of fresh, local tomatoes that have great flavor and texture. Making a tomato basil salad is especially nice when you can pick the basil right from your backyard. This is the first year that I've planted a basil plant. I'm not sure if it is beginner's luck - but it has been thriving and providing us with lots of fresh basil leaves for our salads. Simply sprinkle some extra virgin olive oil and balsamic vinegar over the sliced tomatoes. Salt and pepper to taste. Add some fresh mozzarella sliced and placed between the tomato slices. With a clean, kitchen scissors cut up from basil leaves to put on top. Don't have any mozzarella cheese and don't want to run to the grocery store? Make a tomato onion salad that is just as good. 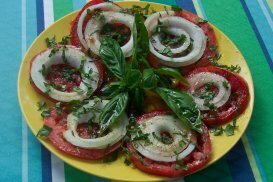 I use the same recipe as above - slice some fresh, locally grown tomatoes and place sliced onions on top. Sprinkle extra virgin olive oil and balsamic vinegar over the vegetables and salt and pepper to taste. 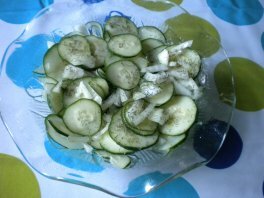 Head to your local farmer's market for fresh cucumbers and onions to make this standard, but favorite salad. This salad can be made ahead of time so that there is no last minute work. 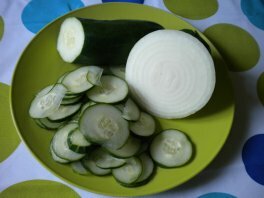 Chill the salad before serving it and slice the cucumbers really thin. Add salt and pepper to taste or sprinkle with dried dill. Let it chill for a couple of hours and the cucumbers get nice and crisp. 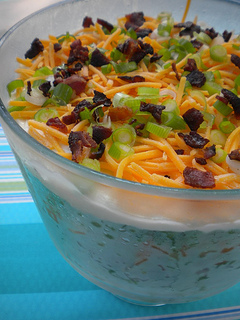 What I like about this 7 layer salad recipe is that it is one way to get my husband to eat salads. Sneak in some extra good for you vegetables like small cut up broccoli and he will still eat it. Served in a trifle bowl, it looks great too! Refrigerate 24 hours for a cool, crisp refreshing salad.